The objective of the present investigation was to design and develop sustained release of Aceclofenac tablets. Aceclofenac sustained release tablets were developed different natural polymers like Guar gum and Xanthan gum and Chitosan. Sustained release tablets of Aceclofenac were prepared by direct compression technique. The prepared tablets evaluated in terms of their Pre-compression studies, Post-compression studies, invitro study and bioequivalence studies. The results of invitro drug release studies showed that formulation-7 (FAS-7) has better sustained over release of drug (98.47%) when compared to marketed product (73.52%) for 24hrs. A. Arunachalam*, A. M. S. Sudhakar Babu, P. Varatharajan. Nanoparticles of atenolol, an antihypertensive agent were prepared to improve absorption and to increase bioavailability. The drug nanoparticles were prepared using chitosan polymer by ionic gelation technique. Nanoparticles of different ratios were formulated and analyzed for drug content, entrapment efficiency, particle size, zeta potential and invitro drug release studies. The particle size ranged between 156±2 to 321±6 nm. The entrapment efficiency of FAN-1 to FAN-5 was ranging from 94.5±0.12 to 99.2±0.23. The drug release studies it was observed that prepared nanoparticles formulation-5 (FAN-5) shows better sustained release (98.75%) for about 24 hrs as compared to other formulations. K. Sabarikumar*, P. Ilavarasan, Sheema Meenaz Shaik. There are many plants and their products that have been mentioned or used in the Indian traditional system of medicine and have shown wound healing activity. Some herbal extracts has been confirmed in human and animal models of wound healing. The plants credited with wound healing action had major chemical constituents like glycosides, alkaloids, flavonoids, triterpenes, mucilages, polysaccharides, oils, vitamins, saponins, glycoproteins, amino acids, peptides and proteins. The polyherbal extract contains the plant parts are whole plant of Adiantium capillus, seeds of Astercantha longifolia, fruits of Callicarpa macrophylla, bark of Ficus benghalensis, aerial parts of Melia azedarach. In this present study ethanolic polyherbal extract is screened for its phytochemical evaluated in wound healing activity in Wister rats by excision wound model using povidone iodine as a reference standard. From the results it was found that Polyherbal ethanolic extract possess significant wound healing action when compared to control and equipotent wound healing activity when compared to standard povidine iodine. S. Vetriselvan*, Rusliza Basir, U. Subasini, C. Velmurugan. Microsphere formulation offers a number of advantages in therapeutics where the sustained release of drugs. Aceclofenac is the most widely used anti-inflammatory agent in the treatment of rheumatoid arthritis. The objective of the present work was to formulate chitosan microspheres containing Aceclofenac in order to provide a prolonged effect and relatively constant effective levels of these drugs in the treatment of rheumatoid arthritis. In this present study microspheres of Aceclofenac was prepared by glutaraldehyde cross-linking, using Chitosan as polymer. The preparation of microspheres by chemical cross linking method was done by using glutaraldehyde as cross linking agent by varying polymer ratio. The prepared microspheres were evaluated for entrapment efficiency, particle size, surface morphology (SEM), Fourier transform infrared spectroscopy and in vitro drug release. The results were conclude that FAM-1(84.36%) can be considered as a optimized formula for sustaining the release of drug for 12 hours. S. Jeganath* and K. Senthilkumaran. The administration of drugs through the nasal cavity is not a new method of delivering drugs Intranasal Therapy has been an accepted form of treatment in the Ayurvedic system of Indian Medicine. It has been used of the delivery of psychotherapeutic compounds in the ancient era, particularly for the systemic effects. The drug delivery through the nasal mucosa provides a number of advantages like a large surface area for absorption, overcomes the first pass effect. The increasing research in the field of novel drug delivery system has led to the development of novel forms like the intranasal route which has been shown to have an equivalent efficacy to the intravenous route. The nasal drug delivery system is very advantageous in the delivery of proteins, peptides and the novel research in the field has led to the development of nose to brain drug delivery systems. We discuss here the relevant aspects of biological, physicochemical and pharmaceutical factors of nasal cavity that must be considered during the process of discovery and development of new drugs for nasal delivery as well as in their incorporation into appropriate nasal Pharmaceutical formulations and the marketed formulations. D. Anish Kumar*, G. Mohanranga Reddy, D. Saidarao. The aim of writing this review on gastroretentive drug delivery systems was to compile the recent literature with special focus on various gastroretentive approaches that have recently become leading methodologies in the field of site-specific orally administered controlled/Sustained release drug delivery. Several approaches are currently utilized in the prolongation of the GRT, including floating drug delivery systems (FDDS), swelling and expanding systems, polymeric bioadhesive systems, high-density systems, modified-shape systems and other delayed gastric emptying devices. In this review, current & recent developments of Stomach Specific floating drug delivery systems are discussed. This review also summarizes the in vitro techniques, in vivo studies to evaluate the performance and application of floating systems. These systems are useful to several problems encountered during the development of a pharmaceutical dosage form. M. Karthikeyan*, P. V. N. S. Pravallika, D. Lokesh, MD. Mustaq Ahmed, B. Sri Devi, SK. Rasheeda Jan.
A validated reverse phase HPLC method has been developed for the simultaneous estimation of Ubidecarenone and Clomifene Citrate in Pharmaceutical dosage forms. The chromatographic separation was carried out on Phenomenex C8 (250 X 4.6 mm, 5 µm) column and Methanol: Ethanol: Hexane in the ratio of 80:10:10% v/v was used as mobile phase at the flow rate of 1.5 ml/min with PDA detection at 275 nm. The retention time of Ubidecarenone and Clomifene Citrate were found to be 2.37 min and 9.72 min respectively. Linearity of both drugs were found to be in the concentration range of 15-45 µg/ml for Ubidecarenone and 12.5- 37.5 µg/ml for Clomifene Citrate. The developed HPLC method was validated by determining its sensitivity, selectivity, linearity, accuracy and precision. The accuracy of the method was assessed by percentage recovery studies at three different levels at 50%, 100% and 150% of its working concentration. The percentage recovery of both drugs in the developed method was found to be in the ranges of from 99.1% - 101.1%, that indicates the good accuracy of the method. This developed method can be used for the routine analysis for the estimation of Ubidecarenone and Clomifene Citrate in bulk and Pharmaceutical formulations. R. Mailvelan*, J. Rajesh, P. Selvamani, S. Latha. Ten novel Schiff’s bases of N″-[tetrazolo[1,5-a]quinoline-4 ylmethylidene] thiocarbohydrazide derivatives 6a-j were synthesized. All the compounds have been characterized by IR, 1hnmr and Mass spectroscopy. 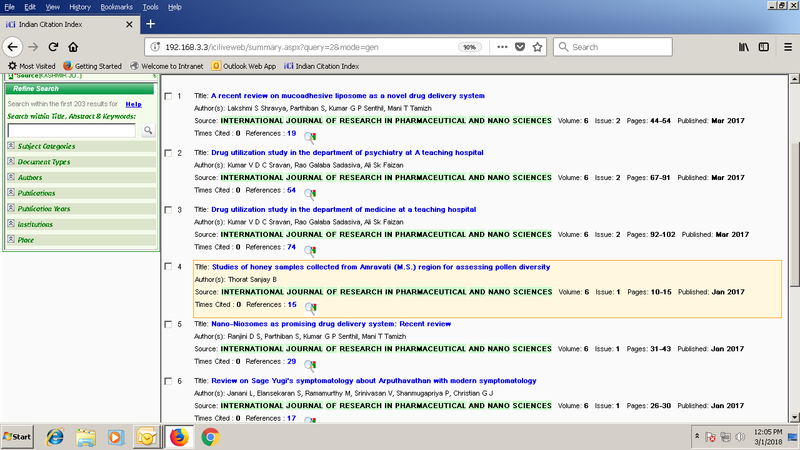 To validate the ethnotherapeutic claims of the synthetic compounds in skin diseases, wound healing activity of few selected synthesized compounds were studied in albino rats by excision wound model using povidine iodine as reference standard, these titled compounds exhibited significant wound healing activity. P. Mail kumaran*, K. Sheeja Devi, C. H. Manikantha mouli, M. Manjula, S. Smylin Ajitha Rani, G. Krishnamalar. Ethanolic extract of Eugenia jambolana leaves were investigated for their Hepatoprotective potential against liver injury induced by paracetamol in rats. The liver damage was induced in male albino rats (200 - 220gm) by administering paracetamol (2 gm/kg) for 7 days and extent of damage was studied by assessing the biochemical parameters such as Total bilirubin, Direct bilirubin, Indirect bilirubin, Serum glutamate pyruvate transaminase (SGPT), Serum glutamate oxaloacetate transaminase (SGOT), Alkaline phosphatase (ALP), Total protein (TP), Albumin and Globulin. Histopathological changes of liver sample were compared with respective control. Treatment of rats with ethanolic extract (200mg/kg) for 7 days resulted in significant hepatoprotection for total protein (6.6 g/dl) only, while at 400 mg/kg, the restoration was significant for enzyme markers, viz. SGOT, SGPT, ALP (22.5 U/L, 18.5 U/L, 58.5 U/L ) in paracetamol-treated rats. The lethal dose (LD50) of the plant was greater than 3000 mg/kg. The ethanolic extracts of Eugenia jambolana leaves have protected liver from paracetamol damage against induced liver injury. Y. Venkata Kiran Kumar*, G. H. Srinivasa Rao, M. Santhiswaroop, S. Dileep Chandra. An isocratic Reverse Phase High Performance Liquid Chromatography (RP-HPLC) method has been developed and subsequently validated to develop new simple and rapid analytical method to estimate the Resperidone in pharmaceutical dosage form. As the drug is polar in nature, it was proposed to select isocratic RP-HPLC method. The separation was achieved with an LC-2010CHT SHIMADZU C18 (150 x 4.6 mm), 5 µm column and Methanol: Acetonitrile: Potasium dihydrogen ortho phosphate (60:30:10v/v/v) as a eluent, at flow rate 1.0 mL/min. UV detection was performed at 234nm. The developed method was validated by accessing various parameters like specificity, linearity, LOD, LOQ, precision, robustness, ruggedness and system suitability studies. From the results it was found that all the parameters are within the acceptable range. Hence the proposed method was found to be satisfactory and would be used for the routine quality control analysis of Risperidonel bulk and Formulation. <span style=""font-family:" 'times="" new="" roman',="" times;"="">K. Manikandan* and K. S. Lakshmi.